Kronplatz is one of the largest and most exciting ski regions in Italy by itself. Part of the enormous Plan de Corones ski mountain, Kronplatz also forms part of the colossal Dolomiti SuperSki region – the largest of its kind in the whole world! Perhaps a top contender for the title of ‘best ski resort you’ve never heard of’, Kronplatz looks and feels like a well-kept secret. UNESCO World Heritage beauty and the accolade of being named Italy’s best ski resort in 2012, the fact that Kronplatz remains such an unknown in the minds of most really is quite the mystery. The largest of the three resorts located in the Pusteral Valley, most of the action takes place around the imposing Kronplatz mountain – hence the name of the resort. There are several towns and villages at the base of the mountain, though it’s San Vigilio di Marebbe that tends to be the focus-point and base for most visitors. Brunico-Bruneck is one of the friendliest and generally most pleasant towns in Italy, while Valdaora-Olang tops the table for families travelling with kids. There’s so much to see and do around Kronplatz, without even taking the skiing into consideration. And as mentioned, the fact that Kronplatz forms part of the world’s single largest ski area says all the needs to be said for what it has to offer every skier at every level! Kronplatz is one of the easiest resorts in the region to access by train. Nearest train stop – Valdaora-Anterselva/Olang-Antholz. 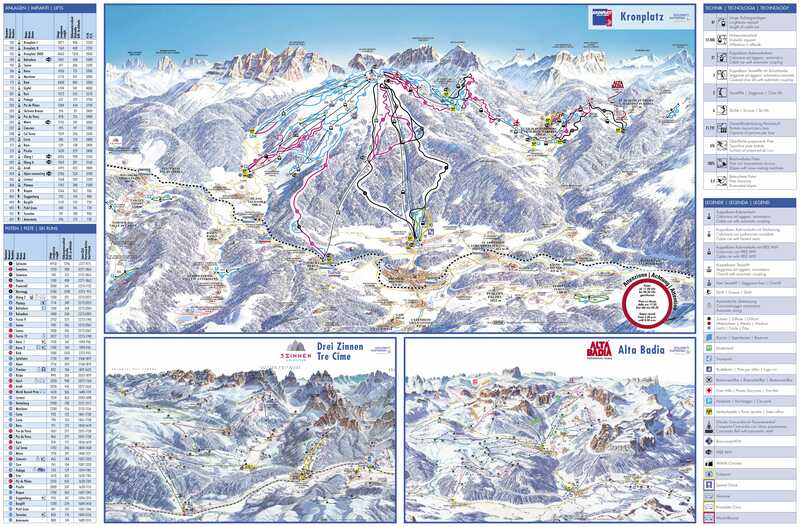 Use the Ski Pustertal Express for their daily transfers within the Kronplatz Ski Area. The connection with the Ski Train makes it possible to commute every thirty minutes between the two ski areas of the Plan de Corones and the Dolomiti di Sesto-Sextener Dolomiten. Whatever your travel plans when heading out to Kronplatz, Alps 2 Alps will offer you the best possible deal on your resort transfers. We calculate the costs of each trip in accordance with the exact requirements of our customers, along with other key factors of importance. This way, we can provide you with the best possible quote for your Kronplatz transfers in both directions, throughout the entire ski season. All of the above will only ever result in our base-rate for ski transfers going down – we never over-inflate our prices at any time or for any reason. We also offer substantial discounts for off-peak, off-season and midweek transfers to Kronplatz. If looking for the best possible deals, travelling outside peak season or midweek typically results in the biggest savings. We offer midweek (Monday to Friday) prices with up to 60% discount than weekend prices. As mentioned before however, this really is little more than the tip of the iceberg…so to speak. Along with the 185km of slopes that are right on the doorstep of Kronplatz, you’re never far from the near-1,000km of pistes the SuperSki region plays host to! Kronplatz is no less than fantastic as a family ski trip destination, with gentle slopes to suit all ability levels and some seriously capable ski schools. The resort itself is packed with amenities and entertainment for any gloomier days you encounter, so a little bad weather needn’t have an impact on your stay. The immediate area around Kronplatz warrants plenty of exploration. Given the fast and convenient transport links connecting Kronplatz with its surroundings, you’ll be in the perfect spot to soak up the very best of this gorgeous ski region. Be sure to read up on what’s on offer, before heading off. As the best deals are always snapped up in advance, we advise booking as early as possible to avoid missing out. Simply get in touch with Alps 2 Alps and let us know your travel plans – we’ll happily take care of the rest!